We are now in December. Can you believe it? 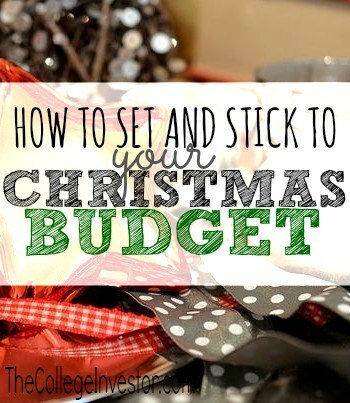 With Christmas literally, right around the corner it’s time you set your Christmas budget if you haven’t already done so. The last thing you want is to completely blow your budget on Christmas gifts. And do you know what would be even worse? Going into debt over Christmas. To keep Christmas fun, relaxed, and financially in balance, here’s how you can easily set and stick to your Christmas budget. Before you can stick to your budget (or hopefully, come in under budget) you first need to determine what you’re going to spend. First, take a look at your finances and see how much money you realistically have to work with without adding any financial strain on yourself. After that write down the name of every person you have to buy for. Now take that initial amount you set and divide it appropriately between your gift recipients. Now let’s move on to sticking to the Christmas budget! It’s so easy to get sucked in by retailers and walk out of a store with three times as much stuff as you meant to purchase. You have to be deliberate in your shopping. To make this easy for you write down gift ideas next to each person’s name on your list. Then when you’re shopping and see one of these items at a great price, buy it and mark off that person’s name. Don’t buy them anything else! If you’re creative you can also make homemade gifts for a lot less. If you don’t want to make everything completely homemade then consider putting together your own gift baskets. You can use a nice blend of items that you found great deals on plus things you made yourself. Not to mention homemade gift baskets are usually a lot nicer than the store-bought alternatives. An easy way to shop deliberately is to shop online. You can use a service like Chippmunk to filter through great deals by store, department, and price. On top of that you can also use coupon codes to make the price even better! In fact you should always look for a coupon code when shopping online. It only takes a minute or two to find one and they can save you some significant cash! It’s tempting to want to go overboard and lavish everyone with gifts. But the sad fact is that two weeks after Christmas is over everyone will forget what you got them. There’s no need to spend a ton of money on Christmas. Instead you can look for creative ways to give that won’t break you financially. I’ve always found in the past that my most expensive Christmas shopping trips is when I leave the house with only the idea that I need to “do my Christmas shopping”. Yes it is – sorry. I shop online, compare prices and look for free shipping. Enjoyed reading this article, gave me a few great tips. I’ve been making my own gift baskets & homemade mason jar gifts of cookie mix, pancake mix etc for a few years now. Add a wooden spoon tied to the mason jar with a pretty ribbon or a dish towel lined gift basket with inexpensive kitchen, bath, or personal items. I save all the samples & little gift giveaways like decks of cards, ear buds,or coupons for free items I get in the mail ,send for through the freebie sites or manufacturers sites & at store giveaways for these gift baskets & for stocking stuffers. I also give magazine subscriptions I get free through Rewards Survey , Rewards Gold & other sites I find through freebie sites. there are lots of great free offers out there, just subscribe to a reputable freebie or blog site, remember if it sounds to good to be true…check the fake freebie lists if you question it, & enjoy the hunt. For example I get 16 magazines free each month I got from the rewards sites I mentioned, over a dozen free t-shirts I recieved as giveaways or designed through Camel, & other manufacturers sites,& won gift cards from Visa, Target, Walgreens, Dunkin Donuts, Starbucks & more – there’s loads of free stuff out there!